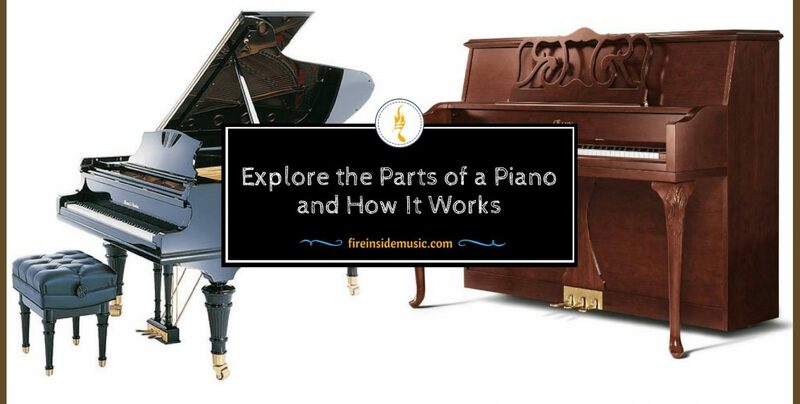 Many aspiring piano players know a lot about the piano, but they don’t know the parts of a piano. However, it is very important to learn what the parts of the piano are, and how the piano works. Thus, one can understand the instrument much better. In turn, this will develop one’s playing abilities. In this article, you will learn all there is to know about piano parts: their place, function and importance. Let’s begin. Basically, there are two types of piano – grand piano and upright piano. Grand pianos are pretty expensive, and they are mainly used for concert playing. On the other hand, upright pianos are much smaller, and they take up a lot less space. They are also much cheaper, and can easily fit inside an apartment, or any small room. 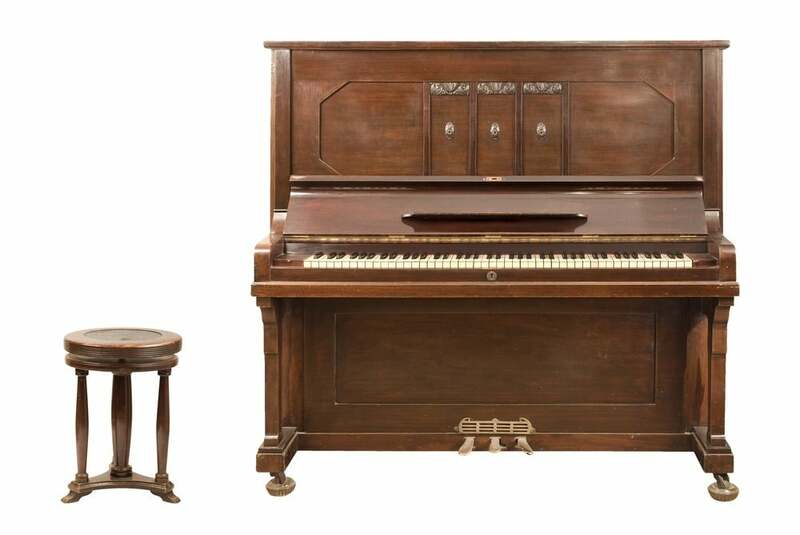 These two piano types are not only different in size and shape. They are also different in the way they produce sound. 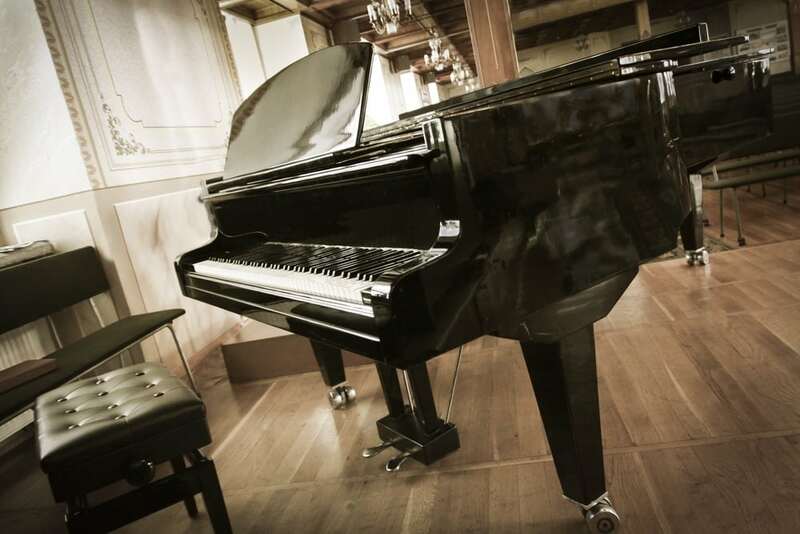 The grand piano uses gravity, as its hammers hit the strings vertically. The upright piano hits the strings horizontally. 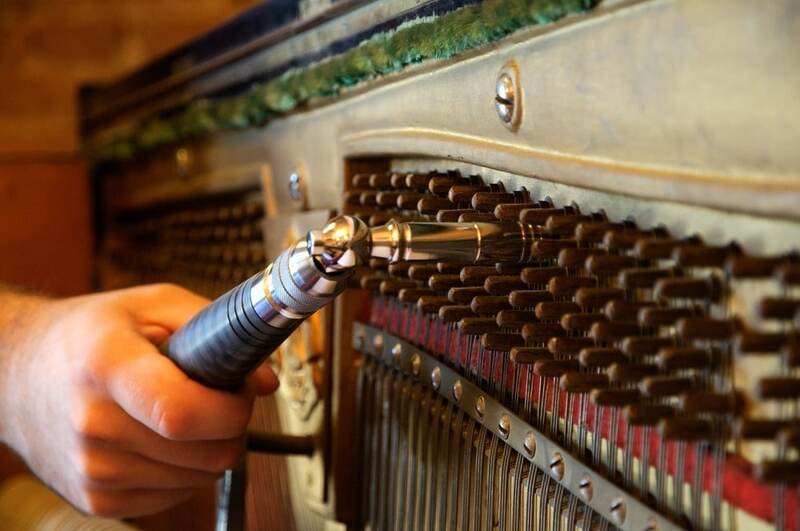 Because of this, the upright piano uses springs to help reset each note while playing. The grand piano is generally considered the supreme type of piano. However, it doesn’t have to be so. Depending on their construction, many grand pianos are worse than upright pianos. Upright pianos have a problem with their springs, because they tend to lose quality. This causes notes to sound “uneven” or weak, and the springs then have to be replaced. Overall, the best option for concert playing is obviously the grand piano. If it’s constructed properly, it simply creates better sound than the upright, and gives more artistic freedom to the player. The piano was created more than 300 years ago. It wasn’t the same as it is today. Over the years, there have been many mechanics who improved it. Bartolomeo Cristofori is generally thought of as the inventor of the piano. When he invented the piano, the most popular instruments that resembled the piano were the clavichord and the harpsichord. However, these instruments were pretty different than the piano. The main difference was in the way they produced sound, because their mechanics were different. The harpsichord had one big problem – sound control. It wasn’t possible for a player of the harpsichord to control the sound. Loudness and softness of the sound were beyond the player’s control. The clavichord was a small improvement in this field, but far from great. Because of this, the clavichord was very popular at its time. But it still wasn’t the perfect instrument. There was simply a need for something new. That’s when the piano appeared. It was created as an attempt to combine the sound control possible on a clavichord with the playing power of the harpsichord. What Bartolomeo Cristofori made possible is the practical use of the piano hammer. It was finally possible for the hammer to hit the staring and then go back to its original position. This “spring-like” quality of the piano actually made it what it is today. This tiny change was the reason why we have the piano today. Finally, there was a reliable way to control the sound. And the player had all the freedom in playing – from soft to loud playing. Cristofori’s solutions were the blueprint for everything that followed. Of course, that piano still wasn’t the instrument we have today. The first type was called pianoforte, literally translated as “quiet-loud”. This was because it enabled the player to control the dynamic of a performance. In the second part of the eighteenth century, the piano started developing fast. There were more manufacturers of the instrument, coming up with their innovations. The sound became louder. Sound sustention was also significantly improved. When great Viennese composers, such as Mozart, began composing for the piano, it was all over. The piano’s reputation as the composer’s instrument was solidified. More and more composers began making music for the piano. The piano is a very interesting instrument, because it is not easily classified. Right from the start, we have a duality. It is both a stringed and a percussion instrument. It is considered a stringed instrument, because strings are necessary for sound production. But it is also a percussion instrument because the strings are hit by a part called the hammer. This duality makes the piano quite fascinating. When a hammer hits a string, the string then vibrates and produces sound. But this is not enough for the production of sound. If that was the only mechanism for producing sound, the piano would be very quiet. In order to create enough resonance, there is the part called the soundboard. The other name for this part is also the sounding board. The soundboard actually helps along with creating resonance. When the strings vibrate, the soundboard vibrates as well, and augments the sound produced. Grand pianos, which are mostly used for concert playing, also have an open lid. This lid is actually of great help during playing. When the strings vibrate, they raise the sound up, and it resonates off the lid. Thus, it goes into the audience, and the audience can hear it much better and clearer. This fact also affects the positioning on grand pianos during concerts. They are placed so that the outer part of the soundboard is faced towards the audience. Up to three strings are needed for one note. A piano can have as much as 200 strings. Bass notes are produced by long strings, while high notes are produced by shorter strings. This is the reason why concert pianos don’t have a rectangular shape, but a curved one. A lot of the strings are quite short, and they don’t need a lot of space inside a piano. When a player hits a certain key, the opposite end of the key goes up. Because of this, a hammer is forced to hit a string (or strings). As a result of this, strings produce sound. The interesting thing is that the keys of a piano are much bigger than they appear from the outside. If you looked inside, you would see that keys are around two feet in length. The hammers on a piano are made of felt. Felt is a type of textile, used for very delicate purposes. It is usually made from natural materials, such as wool, but also from synthetic materials. It is very important for the keys to be in very good condition. Otherwise, they won’t be able to produce sound in a proper way. The keys also have to be steady. 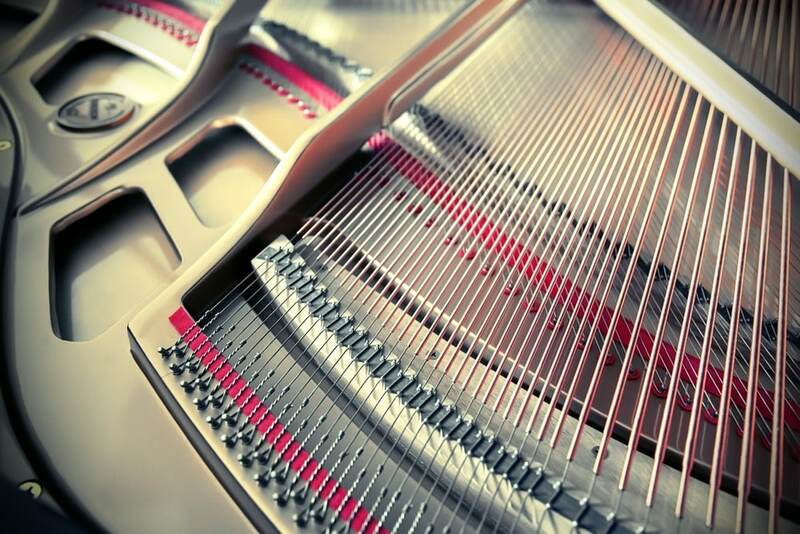 The most important aspect of piano keys is their functionality. This means that they have to go down smoothly, and come back quickly and easily. If the key is not functional enough, it can interfere with your playing. Also, there can be sign of key breakage. For example, if you press the key and nothing happens. If there is no sound, it probably means that something is broken. There is also another part, located behind the hammer. This part is called the damper. When a key is pressed, the damper goes up. And when the same key is released, the damper comes down onto the string. The function of the damper is to muffle the sound. When a string it muffled, it soon stops vibrating. As a result of this, the sound dies down. Dampers are used for all strings, except those for highest notes. High notes simply don’t need dampers, as they as too soft. The dampers can also be controlled in a different way. By depressing the sustain pedal, the player can control the dampers. The sustain pedal is always the far right pedal. When a player depresses this pedal, it lifts all the dampers. By doing this, the player actually extends the life of a note for as long as needed. Many different materials were tried out over the years. However, it turned out that felt is the best material. It is both soft yet reliable, and it forces just enough pressure onto the strings. Over time, piano hammers tend to get too hard. Then, they have to be replaced or redone in order to be used. The far left pedal is also known as the “soft” pedal, or the “una corda”, which means – one string. This pedal enables the hammers to only hit one string. Because of this, the sound produced is much “thinner”. 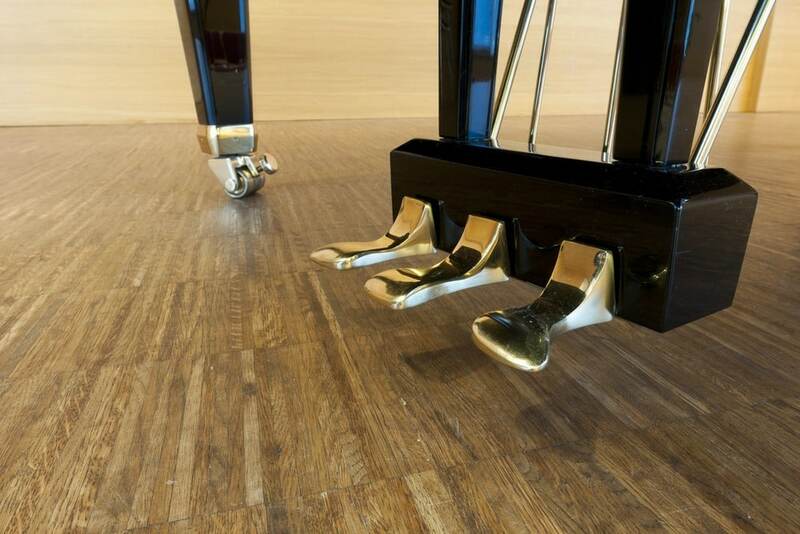 The middle pedal doesn’t exist on all pianos. It is usually referred to as the “sostenuto” pedal. This sometimes creates a lot of confusion among beginner players. The name “sostenuto” can be translated as sustained, but a sustain pedal already exists on a piano. What it does is that it forces the dampers to remain in the off-keys position even after the players releases the keys. This means that a piano player first plays a chord and depresses the sostenuto pedal. The player dos this while the chord is still held. As a result of this, the sustention will apply only to those notes. On the other hand, other notes that the player hits will not be sustained. This definitely sounds quite complicated at first, but it is not. With enough practice, a dedicated player can do it with ease. The most important thing for using the sostenuto pedal is timing. A player has to develop masterful timing in order to use sostenuto to the fullest. Pins are also a very important part of a piano. The strings are fastened to these pins, at the front part of the piano. The pins can be rotated and thus used for tuning. They are moved in a rotating position, in order to increase or decrease string tension. By doing this, the pins actually raise or lower the pitch. On the other side, we have the so-called hitch pins, or end pins. Each string loops around a hitch pin, and then it goes back to the tuning pin that is next in line. It only seems that these are two separate strings. It is actually one and the same string. The interesting thing is that you can play two notes on just one string. Each string has this ability, because it’s in a very tight position. One half of the string doesn’t affect the other half in any way. The agraffes are piano parts that resemble small metal bridges. They have holes through which the strings go. Their role is to hold the strings down precisely in the position they are supposed to be. This is very important, because it directly affects the sound produced. The agraffes serve as guides for the strings. They lead the strings directly above the hammers. If the strings are not in their exact position, the sound will be off. Opposite of the agraffes are the graphite bridges. Their role is to lead the strings around the end pins. They also hold them down firmly. 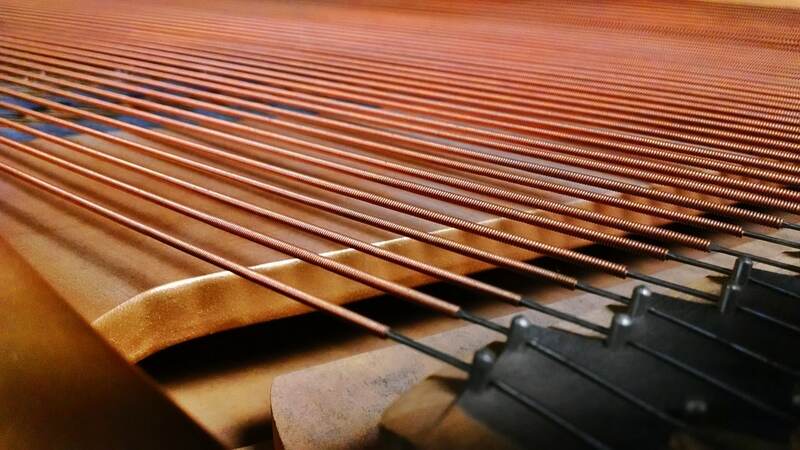 The space between the end pins and the graphite bridges is called the “speaking length” of the strings. The speaking length is the only area where the strings actually vibrate. This is very important, because otherwise – the sound would be affected. It’s definitely not good when unnecessary parts, such as metal pins, start vibrating. Of course, there would be no way to play the piano without the keyboard. Depending on the type of piano, there are different keyboard sizes. 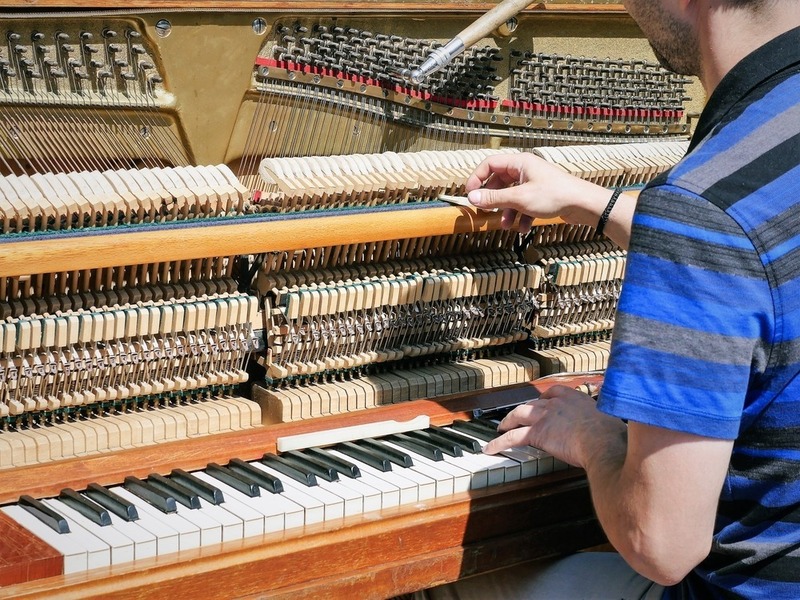 The majority of pianos have 88 keys. 52 keys are white and 36 keys are black. The white keys all deliver natural notes. On the other hand, the black keys all hit half-notes, or half-step notes, as they are also called. There are also smaller keyboards. Those with 76 keys have 31 black and 45 white keys. Those with 61 keys have 25 black keys and 36 white keys. And keyboards with 49 keys have 20 black and 29 white ones.